WOW. Our November Sounding Board™ C.E.O. 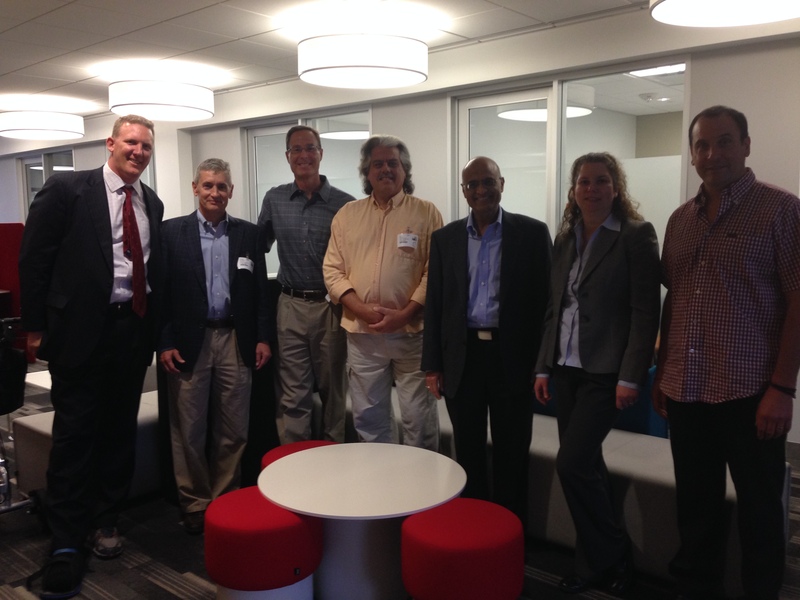 group visit to J&J’s Janssen Pharmaceuticals R&D facility in Springhouse PA was mind expanding in so many ways. Our hosts Nando Bansal, Senior Director & External Project Leader in Immunology along with Gabi Tanis, Manager of Strategy & Operations rolled out the red carpet in terms of their hospitality and the information they shared. Nando’s long career in the Pharmaceutical industry was a bit accidental and built around a mantra between he and his peers of, “Whatever you choose to do, don’t fail.” Mark Cunningham, Senior Director of Research Administration, is a scientist by trade but who clearly has a passion for people and problem solving, concluded our visit with a tour of the campus. “It’s a high risk, high reward business - where all the simple diseases have been cured. We are looking and planning 30 years out.” It’s a long and expensive road that gets traveled from Discovery, to Development, to Commercialization. 18 successive quarters of growth – many of those years growth has been in the double digits. They are the leader in new chemical entities at 13. Their business model is decentralized – if they buy a company, their approach is to leave them alone. Aside from assuring that acquired employees get a J&J umber so they can get paid and that they follow regulations, they leave them alone to flourish. - Products are built with advisory input from the Sales folks to determine the commercial need for the product/asset. A happy and healthy workplace is the goal. How this shows up is a very flexible “work from where ever you need to” policy along with a robust menu of “clubs” that are offered during work hours. In addition to traditional sports offerings, you can join any number of special interest clubs from choir, to gardening to photography, to cooking. The idea behind encouraging participation in these clubs is to encourage casual cross-pollination between people and departments. You will also see a few treadmill workspaces where people can walk on the treadmill while working on their computer or talking on the phone. Janssen has not jumped on the “open space” bandwagon to increase collaboration. While they are creating collaborative community work spaces, they understand that their scientists want quiet private places to think. Hurdles for them include smart management of work space where on any given day 1/3 of the employees are working off-premise along with the availability of offices for new hires who negotiate that perk as part of their sign-on package. We will invest in things that “make good human sense” -- like investing $200 million in the development of an Ebola vaccine that does not have great commercial promise. This is where J&J’s credo comes into play. Click here to read J&J’s credo in its entirety. On behalf of our Sounding Board™ members, thank you Nando, Gabi & Mark for this insiders’ look at an iconic company and for sharing this marketplace leader’s secrets to success. To be a part of our next Sounding Board™ backstage visit to WAWA on December 16, 2014 click here for Membership information or to sign-up.